You don’t have to wait for the start of a new year to make a resolution to get in shape and re-work those bothersome parts of your complexion. If you’re unhappy with the way you look, what’s wrong with doing something about it now? Summer is as good a time as any to refresh your appearance and recharge your personal goals. The confidence boost you’ll get from looking and feeling your best is unequivocally priceless. In some cases, losing those varicose veins or getting to the bottom of those migraine headaches may lead to the confidence you desire. Although true beauty comes from within, physicians around our region can help you to achieve a new look that you’ve only imagined. Not only are today’s procedures safer, quicker and more effective than before, but the doctors administering care are genuinely concerned with the overall well-being of their patients. Just because you suffer from varicose veins doesn’t mean you can’t visit your friends and family across the country. You just need to take proper precautions and pack plenty of water. Varicose veins are gnarled, enlarged veins. Any vein in your body could become varicose, but the veins in your legs are the ones most commonly affected. When this condition occurs, the valves inside the vein stop working properly and fail to keep blood flowing normally. As these valves weaken, blood can flow backward into the veins and collect there, says Dr. Rimas Gilvydis, who treats varicose veins at Gilvydis Vein Clinic, at 2127 Midlands Ct., Ste. 102, in Sycamore, and at a recently opened office at 2631 Williamsburg Ave., Ste. 202, in Geneva. When the backed-up blood bulges into the veins and makes them larger, they become varicose. Symptoms include achy or heavy-feeling legs, muscle cramping, swelling, itching, inflammation of the skin and restless legs in the evenings. If left untreated, varicose veins can lead to more serious problems such as leg swelling, ulcers, blood clots or bleeding. This disease can cause pain and discomfort, especially when traveling by car or airplane for hours at a time. “Varicose veins get bigger over the years, because when you stand, blood pours down these veins,” Gilvydis says. While you’re traveling, one thing Gilvydis suggests is waking up your calves by doing heel lifts in the plane or in the car. Simply lift your heel like you’re getting on your tippy toes. This process engages your calf muscle. Another useful tip is to drink plenty of water, instead of alcohol and other drinks that can dehydrate you. Staying hydrated helps to keep vein walls from narrowing and can prevent constipation, which also puts stress on the venous system. One final tip is to use compression stockings, which are designed to improve blood flow from the legs to the heart. With the help of advanced ultrasound diagnostics, the team at Northern Illinois Vein Clinic can detect varicose vein disease and recommend the most effective treatments to eliminate venous issues. One possible route is through a laser procedure, which is quicker, safer and less invasive than surgery. With the proper preparation, you can keep symptoms in check, lessen your risk for blood clots, and feel more relaxed and comfortable during your trip. To learn more or to schedule an appointment or free screening, call Northern Illinois Vein Clinic at (779) 696-8346. Dr. Andrew Gordon wants you to know if you suffer from migraines, headaches or other neurological problems, there’s a cost-effective alternative to visiting a hospital. As one of the nation’s largest independent neurology groups, Northwest Neurology delivers a wide variety of services and specialties, often with a lower cost and a higher degree of patient-centered care. Gordon is one of 17 physicians and four nurse practitioners working at Northwest Neurology’s locations in Lake Barrington, South Barrington, Crystal Lake, Rolling Meadows and Libertyville. Two sleep medicine specialists are expected to join this fall. “Northwest Neurology is unique in having greater depth and broader scope than a typical neurology practice,” says Gordon. And, Northwest Neurology physicians have medical staff privileges at many of the area’s leading hospitals, including Advocate’s hospitals in Barrington, Elgin and Libertyville; Northwest Community Hospital, in Arlington Heights; and Amita hospitals in Elk Grove and Hoffman Estates. Inpatient services are handled by five Northwest Neurology neurohospitalists. One of Gordon’s specialties is migraine and headache disorders. When it comes to treating headaches, he invests time in the “detective work” that helps him to get to the bottom of the issue. Often marked by nausea, vomiting and extreme sensitivity to light and sound, migraines begin with inflammation in the brain’s blood vessels. Migraines that occur just a few times a year usually can be treated with over-the-counter medicine, says Gordon, but when these headaches become frequent, it’s time to see a neurologist. An individualized treatment plan that utilizes preventive strategies and fast-acting medication to treat breakthrough headaches can help to improve a patient’s quality of life, he adds. Oral medication, nutritional supplements and Botox injections can be highly effective treatments for chronic migraine, Gordon says, but he’s also looking toward several new advancements including monoclonal antibodies that block CGRP, a key brain peptide involved in migraine pathogenesis. He’s also using Cefaly, a new FDA-approved device that uses neuro-stimulation technology to help reduce the intensity and frequency of migraine headaches. Migraines and headaches represent just one subspecialty at Northwest Neurology. The practice maintains one rapid-access clinic focused on concussions and another one focused on transient ischemic attacks (TIA) – mini-strokes that display short-lived symptoms. “We spearheaded a project with Advocate Health System to provide rapid clinic access for patients discharged from the emergency room who have had possible TIAs,” explains Gordon. “We get folks in for an office appointment within 24 hours. This helps to reduce unnecessary hospitalizations and lower costs. We’re always trying to be innovative in our thinking.” The TIA clinic now serves all six hospitals served by Northwest Neurology. The practice also maintains one of the Chicago area’s largest multiple sclerosis (MS) centers, a growing practice, in part, because of its integrated care model, in which physicians and patient services are brought together under one roof. MS patients have easy access to a large infusion center and two locations offering MRI services. Using the latest technology available in high field magnets, Northwest Neurology’s MRI fellowship-trained radiologists read all scans. “After patient studies are reviewed, we can get back to the patient right away with results,” says Gordon. Northwest Neurology’s emphasis on specialized care has helped the practice to grow while retaining key features of a smaller clinic. It’s much appreciated by those who suffer with frequent migraine headaches. If your life is being interrupted by frequent headaches, maybe it’s time for a deeper look at how a neurologist can help you to reclaim your lifestyle. Presence Saint Joseph Hospital-Elgin has launched a new interactive way to lose weight and maintain a healthy diet. The N.E.W. You Center hosts an innovative wellness program that emphasizes nutrition, education and wellness. The staff works closely with you to build a plan tailored to your weight loss goals, which will help you on your journey to improved health. “This program is designed for people to lose weight and feel healthier,” says Anandita Gephart, M.D., medical director of the N.E.W. You Center. The program includes weekly professional coaching, weight loss management meetings with staff members, and a complimentary 12-week Y-FIT program membership at the Taylor Family YMCA in Elgin. Once you meet with a health coach, you can decide which weight loss program is best for you. One option is the Ideal Protein method, which is a natural and effective weight loss plan. This program combines partial replacement meals and snacks, such as shakes, with protein and vegetables. With this protocol, you will get personalized support by a certified coach, keep a daily journal, and receive a program workout book where you’ll outline what and how much you eat. While an average patient may reach their weight loss goal in 12 weeks, they’ll be encouraged to participate in additional coaching for up to a year to maintain a healthy weight. Then, there’s CORE 4, a 12-week, adult weight management program that provides guests with knowledge and tools needed to successfully manage their weight. The program includes three one-on-one dietitian sessions, nine weekly group workshops, metabolic and cholesterol screenings, and weekly goal setting and progress updates. Curtis Perrin, of Elgin, participated in the CORE 4 program. Perrin, who has arthritis in his back and left hip, was having a hard time working out. But with this program, he was able to exercise in the swimming pool with a class aimed at people who have arthritis. He uses a workbook to track his weight loss and the food he eats. “There were 12 people in the class, and everyone would set weekly goals and we would talk about our experiences,” Perrin says. He was 397 pounds when he started the program and currently weighs in at 372 pounds – a difference of 25 pounds lost in just 12 weeks. 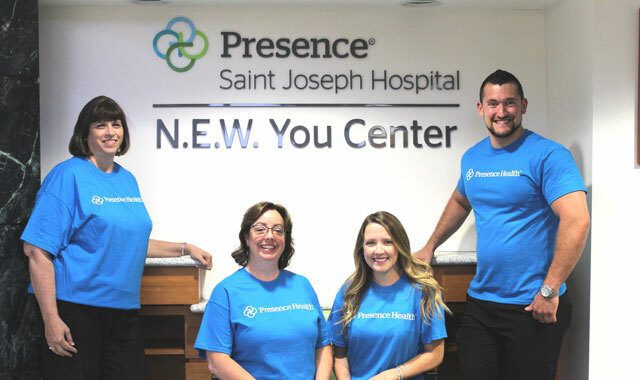 For more information on the program, call (847) 622-2080 or visit presencehealth.org/NEWYou to download a health profile, complete your risk assessment or sign up for a free workout. This entry was posted on Tuesday, July 18th, 2017 at 11:59 am	and is filed under Health & Fitness. You can follow any responses to this entry through the RSS 2.0 feed. Both comments and pings are currently closed.